The Epitome of Distinction and Elegance awaits your Vacation Pleasure on the Magnificent Big Island . 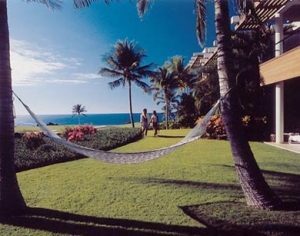 . . at the World-Class Resort Destination Masterpiece of Mauna Lani. You’ll Savor the Spectacular Ocean Views and Breathtaking Sunsets from the Privacy of your Luxuriously Appointed, Designer-Decorated 1-Bedroom or 2-Bedroom Oceanview Big Island Condo . . . Nestled on 19 Spectacular Oceanfront Acres Featuring Gorgeous Views of the Blue Pacific . . . Framed by Beautiful Swaying Coco Palms, Emera1d-Green Fairways and Lush Tropical Grounds and Gardens. 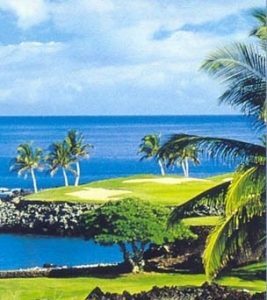 You’ll truly appreciate the Casual Luxury of your Big Island Vacation Condo Rental on the Magnificent Kohala Coast, Exquisitely Appointed featuring the Finest of Furnishings in an Elegant Tropical Decor. Relax in Style from the Privacy of your own Double- Sized Tiled Lanai, while Soaking up the Magnificent Views as the Gentle Tradewinds Caress your Senses and the Sound of the Surf beckons your call. 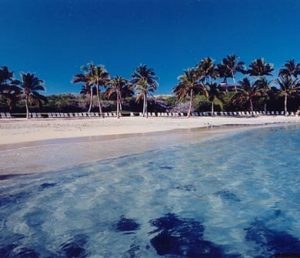 Appointments of your Big Island Vacation Condo Getaway – – Located in your Own Private Gated Community Near the Famous Mauna Lani Bay Hotel & Bungalows – – Feature Gourmet Kitchens with Skylights, Oceanfront Master Bedroom Suites (many units), Daily Housekeeping Service, In-Suite Washer/Dryers, Central A/C, Color-Cable TV & VCR’s. Your Big Island Vacation Home is Truly in a Class of its own! For your Added Vacation Pleasure, Take a Refreshing Swim in the Heated Waterfall Pool, then Relax in the Jacuzzi Spa. You’ll also enjoy Championship Golf with Preferred Guest Rates at both Mauna Lani Courses, featuring the Signature Par-3, 15th hole – Bordered by Striking a’a Lava and Coco Palms. Our on-Site Concierge will assist you and your party with all of your on-island travel needs. Additional Resort Amenties Showcase a Private Beach Club, Superb Tennis, Fitness Center, Acclaimed Restaurants . . . and the Mauna Lani Spa where you can experience Authentic Hawaiian Treatments in Beautiful Gardens and Spa Rooms that Capture the True Essence of Island Nature. 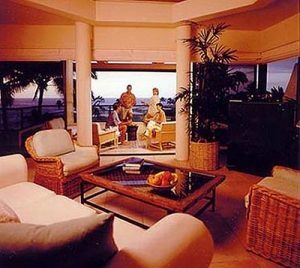 Welcome to your own Big Island luxurious Vacation Condo Getaway at Famous Mauna Lani Resort . . . in Truly a Class of its’ own . . . at the Stunning Point at Mauna Lani. Your Luxurious Big Island Vacation Condo Getaway located at Stunning Mauna Lani Resort Features your Choice of Spacious 1-Bedroom, 1.5 bath Big Island Condos that Accommodate 4 Guests: Or Expansive 2-Bedroom/2.5 bath Condo Rentals – Many Featuring Oceanfront Master Bedroom Suites – that sleep up to 6. All Towels & linens Provided.